In the month of Agrahayan, the eighth month of Bengali calendar, (early December) over 500 Nayakrishi farmers from 19 districts got together in Tangail to exhibit the rice varieties in their own collection and to discuss the issues that has caused threats to the preservation of rice varieties. It was a festival organized by UBINIG and Nayakrishi Andolon held during December 2 – 4, 2010 in Bishnupur village of Tangail. Climate change and natural disasters are being used as an excuse to introduce hybrid and GE rice to farmers without looking into the potentiality of the local varieties to address these situations. However, Nayakrishi farmers demonstrated that such technological solutions are not needed as they have enough experience, knowledge and the collection of varieties of rice which can deal with changing climatic conditions and also ensure productivity to feed the people. It was not only the farmers, but a good number of agricultural scientists, policy makers and political leaders who expressed the need for the preservation of local varieties of rice. The question has been posed as whether technologically induced varieties or the local can help feed the people and the question of preserving thousands of local varieties has been ignored. Farmers’ knowledge has been undermined in the face of technological innovations in rice. Farida Akhter, Executive Director of UBINIG highlighted the availability of specific rice varieties related to each paddy season such as Aus, Aman and Boro. Bangladesh is small but diverse in ecological conditions and rice varieties are available specific to geographic and ecological conditions. For the Bangladeshi people, rice is not only a staple food, it is also important for cultural and social reasons. However, despite being the source of at least 15,000 varieties of paddy, Bangladesh was offered with high yielding varieties developed in the laboratories packaged with the use of chemical fertilizer, pesticide and ground water in the of Green Revolution. Norman Borlaug was called the ‘father’ of Green Revolution. However, it is to be noted that there is no ‘mother’ of Green Revolution, as Green revolution because of its use of environmentally and ecologically harmful chemicals and pesticides contradicts the notion caring and nurturing. Green Revolution has also negative impact on women making them redundant in agriculture. As a result the glaze of the Green Revolution faded out only in a few decades. The yield of the High Yielding Varieties (HYVs), the products of Green Revolution dropped down very quickly. The next step was the introduction of the hybrid rice. The genetic base of rice has been further narrowed down. Genetic Engineering is the latest development in the efforts of exploiting the farmers. Monsanto, DuPont, Bayer etc. are the giants for genetic engineered rice. Golden Rice is genetically modified BRRI dhan -29. At present companies are aggressively promoting 60 hybrid rice varieties causing serious concern about environment and ecology and their actual agronomic value and economic return to the farmers. Rice genetic resources are being taken out of the developing countries to International Rice Research Institute, located in an Asian country – the Philippines, but actually it is taken out for storage in Fort Collins, USA. A seed vault has been established in Norway for global conservation of plant genetic resources funded by Rockefeller Foundation and Bill Gates Foundation. The common question is asked, how are we going to feed the growing population with local varieties? The answer is first of all local varieties does not necessarily mean low productivity varieties. There are many varieties which are equal to the IRRI developed varieties in productivity and they also help provide feed for livestock and help keep other uncultivated sources of food. It is a myth that modern varieties have helped eradication of hunger. There is no alternative to maintaining and nurturing crop diversity and enhancing genetic resources. Often performance and productivity of farming household or the total agricultural system is ignored to highlight the productivity of a modern variety. Farhad Mazhar, Managing Director, UBINIG said that the farmers and scientists have a common goal to feed the people. However, science is segregated into two directions: the corporate science and the real science. This is particularly true when we talk about enhancing the performance of agriculture by integrating the latest development of environmental science, ecology, biodiversity and genetic resources including the local and historical knowledge of the farmers. The corporate science claims that productivity is the factor of the ‘gene’ and ignores the environment and the ecological context of an agricultural system. The ‘gene’ thus becomes a raw material that can be exploited and capitalize to produce and market proprietary varieties. The focus is for commercial gain of the companies. We must remain aware that there are three different battles going on three different fronts: oil, seed and water. Unless we are aware that corporations want full control over the seed and agricultural sector we will soon erode and destroy the farmer’s seed system. Keeping this perspective in mind Nayakrishi Andolon is desperately trying to collect, conserve and reproduce the local varieties of rice. It is time that we initiate institutional collaboration to conserve our rice varieties. This is the primary message of this conference and we are expecting that policy makers who are present here will take necessary steps to bridge the relation between the scientists and farming communities. It is undisputed fact we need to increase production of food. But how we are going to assess the performance of different agricultural systems? In the modern agriculture it is mainly done as what is called ‘single plant paradigm’, by calculating the productivity of the so called HYV variety. On the other hand Nayakrishi Andolon insists on the productivity of the total agricultural system, i.e., system yield. Ecological agriculture is geared to increase the productivity of both a variety as well as the system. So, our goal is same, feeding the people, but we must not undermine the productivity function of biodiversity-based ecological agriculture. In places where no pesticides and chemical fertilizes have been used, the availability of uncultivated food increased. Genetic resources of plants and animals should be maintained in the interest of humankind for today and tomorrow. We expect support from the ministry of Agriculture and the political parties for maintenance of biological diversity. Local rice varieties can cope with climatic changes and natural disasters. But now new rice varieties are promoted in the name of climate change. Dr. M. A. Sobhan, consultant, UBINIG showed in his presentation that Bangladesh has different local varieties suitable for climatic conditions and geographic locations. Broadcast amon rice varieties have been grown in the low lying areas of the greater districts of Sylhet, Mymenshing, Comilla, Dhaka, Faridpur, Pabna, Rangpur and Rajshahi. Many local varieties including’ Chamara, Digha, Dhepa, Gabura, Lakkhi, etc. have been grown in these regions. The transplanted local varieties of rice are more adjusted to the environmental amplitude of this time. The important varieties include Lalmota, Sadamota, Rajushail, Patnai, Nonashail, Jhingashail, Indrashail, Kataribhog, Tulsimala, Kalijira, etc. It was revealed from an experiment conducted by Bangladesh Rice Research Institute (BRRI) that BR 23, BRRI dhan 40, BRRI dhan 41 gave good yield up to 100cm of water-logging. The yield ranged between 35-40 maunds (one maund = 37.32kg) per acre. The local varieties like Birpala, Sadamota, Jatabalam, Gandhakostori, Shorobimaloti, Haribhog and Harishankor can survive better. These water logging tolerant rice varieties give yield ranging from 24-27 maunds per acre. The International Rice Research Institute (IRRI) has developed some submergence tolerant rice varieties which can tolerate submergence only up to 15 days. The important varieties include: (1) Sharna sub-1, (2) Shamba Mashuri sub -1, (3) BR11 sub-1, and IR 64 sub -1. The problem is that the plants die if the length of submergence exceeds 15 days. The yield reduces if the flood water is turbid. Moreover, there is risk of loss of crop in case the submergence takes place after flowering of rice plants. On the contrary the local varieties of rice like Chamara, Dhepa, Boron, etc grow with rising water. The plants grow 3-15 feet. These varieties have matching affinity with water levels, as you please. The life cycle of these varieties are so fine tuned with water regimes as if a garland without a thread. These varieties yield if there is flood and these also yield in case there is less water. Similarly, the local varieties of Boro rice are photo-insensitive like the Aus rice varieties. Cultivation of Boro rice has been continued in the flood plain areas of the Shurma, Kushiara, Meghna and Brahmaputra rivers in the greater districts of Sylhet, Mymenshing and Comilla. The local Boro rice varieties are not only suited to the soil but also to prevailing temperature, day length and other environmental attributes. Still there are about 50 varieties maintained by the farmers. These varieties include Rata, Lahaya, Banshful, etc. To meet the drought conditions, Drought and erratic rainfall problems of Aus rice production, the local varieties of Aus rice have been selected. The important varieties of Aus rice grown in this region include Kalabokri, Shoni, Kalamanik, Shaita, Voira, Kharajamri, Vaturi, Mulkeaus, Shankopoti, etc. About one million hectares of land in 12 coastal districts including Cox’s Bazar, Chittagong, Feni, Noakhali, Lakshmipur, Bhola, PatuaKhali, Pirojpur, Barguna, Bagerhat, Khulna and Satkhira have varying levels of salinity. The salinity reaches its peak in the dry season in Chaitra (mid March-mid April) and it is lowest in the rainy season. Local varieties of rice still cover the major areas of cultivable land. Local varieties cover 56.45 percent of Aus rice area, 60.79 percent of Amon rice area and 17.55 percent of Boro rice area. The important local Aus rice varieties include Sholoi, Kali, Benamuri, Chakon, Shaita, Dholishaita, Ratul, Kumrabona, Chengi, Manikjhuri, Gorishaita, Kaloshaita and Hashikolmi. The Amon rice varieties include Lalmota, Chikondhan, Motadhan, Kajla, Joyna, Rajashail, Gondhokosturi, Chaulamoti, Dulokucha, Chaulamatari, Kauathuti, Kalarajashail, Motamota, Girmi, Dudhkolom, Khoia, Baleshwar, Dudhmala, Kutiagni, Lalchikon, Chumimoshori, Dingamoni, Modhumala, Chaplashail, etc. The Bororice varieties include Chaitaboro, Khatbhojon, Jamainaro, Kaliboro, Sholoi, etc. On the other hand, the High Yielding Varieties (HYVs) of Amon rice include BR 23, BRRI dhan 40 and BRRI dhan 41. These varieties can tolerate mild to medium levels of salinity. BRRI dhan 47 is a HYV suitable for cultivation in the coastal region. This variety is reported to be tolerant to 11-14 D.S/ meter of salinity in seedling stage and rest of its life cycle to 6 D.S/meter of salinity. There is no alternative but the local varieties of rice having wide genetic base for saving the crops from impending damage due to factors related to global warming and climate change. The use of the seeds of the local varieties of rice and associated technologies as developed by the farmers should be ensured. Programs for maintenance of the local varieties of rice in culture in the hands of the farmers should be implemented on priority. Nayakrishi (new agricultural movement), biodiversity based ecological agriculture needs extension and establishment in the interest of farmers and the environment against the present devastating saturation due to practicing chemical agriculture . Agricultural scientists appreciated the availability of the wide range of rice varieties that were exhibited by the farmers. However, they wanted to ensure food security through technological varieties and not the local varieties. Dr. Mohammad Abdul Mannan, Director General of Bangladesh Rice Research Institute (BRRI) talked about increase of production through HYV. He said at the time of liberation of Bangladesh in 1971 we produced only 10 million metric tons. Now, in 2010 we produce 35 million tons of rice. Interestingly the newer rice varieties promoted by BRRI are not meant for meeting hunger but for export. He mentioned that Aromatic rice Banglamoti (BRRI dhan 50) has recently bean released from BRRI. Population is increasing but cultivable land is decreasing. Surface water use should be increased and the under ground water use should be reduced. We believe in less input, less chemical fertilizer and less pesticides use for crop production. A farmer in Bangladesh feels secured about food if he has required rice in his store. By food security we mean secured availability of rice. The food insecurity was acutely felt in 2007 when we had flood and SIDR. Our neighboring country India raised the price of rice abruptly. We even failed to import from Vietnam and Thailand. Rice security dictates all other securities including political and economical. Dr. Nargis Akhter, Principal Scientific Officer, BJRI said, We depend on rice for our calorie need of food. Rice productivity has increased recently. The scientists have been conducting research for solving the problem of food shortage for humankind and ensuring food security of the population. About 20 - 30% of the land in our country goes under water. The global environment has been polluted. Sometimes there is flood and there is drought in other times. It is perceived that rice production in Asian countries will be declining due to climate change. The production of wheat, maize, etc. will also reduce. It is also suspected that there will be reduction of 13-15% of cereal production. There will be depreciation of 15% of rice production in the neighboring country India. There will be yield reduction in rice in the flood affected areas. Both HYVs and local varieties should be grown matching the agro-ecological situations as appropriate. The current fallow lands should be brought under cultivation for increasing food production. Healthy seeds should be used for crop production. We have to be more careful for maintaining and improving soil fertility. Pest predators may be maintained for checking pest infestation. The cultivation of the local varieties of rice should be encouraged. The availability of feed for the livestock may be improved by growing the local varieties of rice. Dr. Rahima Khatun, Chief Scientific Officer, BJRI said, rice is the staple food of about 20% of the people of the world, Oryza sativa variety indica is grown in Bangladesh. Local varieties of rice have many rare attributes. These varieties should be maintained in cultivation. We get 60-70 percent of our calorie requirement from rice. Our cultural heritage is linked with rice. The yield of rice is dependent upon season. Rapid erosion of local varieties of rice has taken place after the introduction of High Yielding Varieties. Still there are some local varieties for aus, aman and boro seasons. Rice covers 77% of cultivable land in Bangladesh. Many of our rice varieties having rare attributes have been taken out of the country and deposited in the international gene banks. Farmers have been made dependent on market for supply of seeds. Consequently, production is sometimes constrained for short supply of seeds. Local rice varieties are adapted to variable ecological conditions and also have resistance against common disease pests. On the contrary hybrid rice genotypes are vulnerable to biotic and abiotic stresses. It is commendable in this context that the Nayakrishi farmers have been maintaining three thousand varieties of rice in cultivation as against seven thousand varieties of rice conserved in gene bank of Bangladesh Rice Research Institute (BRRI). Maintenance of local rice varieties in cultivation at farmer’s level should be patronized. We have to care for our soil health. This is because the soil is the base for crop production. The use of the local varieties of rice will increase if we know about the attributes of local varieties side by side with the HYVs. We have to have special program for maintaining the local varieties of rice. 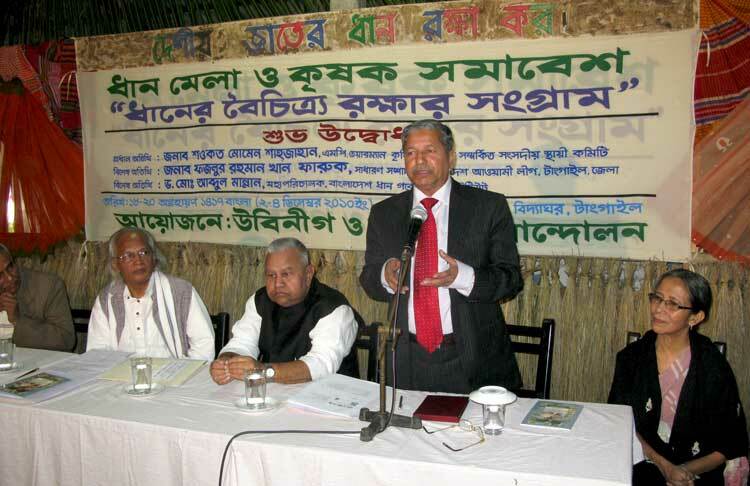 Fazlur Rahman Khan Faruque, President of District Awami League said we introduced IR8, but did not think of environment. Field Marshal Ayub Khan introduced IRRI rice. Farmers were organized for growing rice with irrigation. Let us come together, go on with research findings. I had visited UBINIG in 1996 along with the then Agriculture Minister, Motia Chowdhury. Let us work together for betterment of people. Shawkot Momen Shahjahan; M.P. said seed is the key to agriculture. Five Coconut trees, 5 betel nut trees are not equal. The difference is hidden in seeds. We had varieties of seeds, birds, and fish. Most of them have been eroded. Rice research initiated in the Philippines. Only 5-10 kg rice were produced per decimal in the old days. A total of 34.4 million metric tons of rice were produced last year (2009) in Bangladesh. Hybrid rice and golden rice have been opposed. Hybrid rice gives good yield but the taste is not so good. Chiniguri, Kalijira, are very good. Yield of these varieties should be improved. Food security is a complex issue. Food Security means to offer the required nutrient for the people. Food security does not mean to have enough food in the storage for all the people. People must have access to the required amount. Agriculture Ministry and Food Ministry have been categorized as the successful ministries at the moment, as commented recently by Ershad. The present government is committed to ensure the use of surface waters. The time when tube well and chemical fertilizer was introduced, the farmer did not like it. But initially there was good response but very soon there was a declining trend. Abdul Aziz Chankha, Chairman, Pathrail Union BNP said, UBINIG started activities here in Pathrail about one and a half decades ago, the philosophy that is now acknowledged today nationally and internationally. The message of Nayakrishi is very bold to rightly shape agriculture of Bangladesh in a dynamic design. I appreciate the perception of Nayakrishi farmers as reflected from their brilliant presentation. I also appreciate the conservation of rice genetic resources as maintained by Nayakrishi Seed Network. Rasheda Begum Hira, M.P, BNP appreciated Nayakrishi Andolon and UBINIG for maintaining indigenous varieties of rice. The Nayakrishi farmers have been maintaining crop diversity and at the same time increasing system yield. UBINIG has been advocating a natural system, biodiversity based ecological agriculture. We have to have local variety of seeds to cope with changing climate. The farmers should be rewarded for maintaining the local varieties and therefore the production of local varieties should be subsidized by the government. The loans given to farmers are never lost. The farmers do not swallow money. They will buy cow, goat or seeds. The country benefits even if they use it for soil improvement. The Nayakrishi farmers have mentioned that there has been significant improvement of soil by mixed cropping. Soil is in fact part of the mother earth. We have over-used it. We have to be careful about maintaining soil health. Both the butcher and the farmer care for the cow. However, there is difference between these two types of treatments. The butcher fattens the cow for slaughter for business gain. On the other hand the farmer maintains the cow for sustaining his or her livelihood. The nature has been maintaining us. We need to learn from the nature. The nature has not created anything for nothing. I am pleased to see the Nayakrishi model. Food sovereignty can be achieved if Nayakrishi is extended all over the country. The Nayakrishi farmers grow crops based on seasons. The Nayakrishi endeavour deserves appreciation. I shall raise these points in appropriate forum. Amon rice is a dependable deposit. The farmers grow it for sustenance. We can grow rice for export. We grow such varieties which can be exported. Unfortunately we do politics with rice. We commit to provide rice at Tk 10/kg. But then where the farmers will get the balance which they spent in excess for production? Will they be able to sustain production of rice? There is no farmers’ representative in the Parliament. There must be farmers’ representation in the Parliament. The farmers definitely have the ability to represent. Matiur Rahman Moti, upazilla chairman, Delduar said, our crop production suffers due to drought and flood. Our crops became more vulnerable to natural disasters after the introduction of high input based production practices. In this context UBINIG has been experimenting for introduction of biodiversity based ecological agriculture. I am impressed with the rice varieties put on display in this rice fair. There are rice varieties adapted to drought, flood, salinity, etc. There are aromatic rice varieties. There are varieties with fine grain, bold grain and long grain. There are varieties with different colors and uses. There are varieties for pressed rice, puffed paddy, puffed rice, cakes and of course for different types of boiled and fried rice preparations. These varieties of rice and other crops must be maintained in culture. Khondakar Abdul Baten, Member of Parliament, Awami League said, the people of Bangladesh are highly dependent on agriculture to maintain their livelihood and food security. Achieving food security and reducing poverty in Bangladesh has been a challenge for the government. Many people in rural areas of Bangladesh are food insecure due to different factors like flood, river erosion, storm, drought and salinity. Sometimes these factors cause loss of crops. The affected people are compelled to migrate to cities in search of livelihood options. Some of them are caught in the vicious cycle of drugs, violence, and illegal migration and anti-social activities. Development efforts should be focused for creation of job opportunity in the rural areas so that people can sustain their parental occupation. I appreciate UBINIG for its activities on Nayakrishi, biodiversity based ecological agriculture. I am happy to see the large collection of local varieties of rice. These collections should be used to face climate change variations and diversified uses. Nayakrishi farmers from different districts expressed their position to preserve and cultivate local variety of rice. Manjurul Alam, Cox’s Bazar said good yield of crop is ensured by plowing the land by wooden plough. There is no need of irrigation for growing rice in kharif season, because most of the rice varieties grown in this season are local varieties. Cultivation of IRRI rice for consecutive years deplete the soil and yield of rice declines sharply. The hybrid rice came after IRRI rice varieties. The hybrid rice seeds can not be maintained on farm. The productions of hybrid rice need the application of both chemical fertilizer and pesticides. In the winter season we produce salt. On the same land rice is grown in the rainy season. We grow local varieties of rice. These varieties are not affected by seasonal flood. Even these varieties remain unaffected in ease of cyclones and tornadoes. These varieties are resistant to common pests. We grow Ashail Lemburu, Binni, Khandailla, Rajashail. There are local rice varieties adapted best to changing climatic situations. The farmers in my village were very fond of hybrid rice about 4-5 years ago. Now their perception has changed. We were enrolled in Nayakrishi Andolon about 10-12 years ago. We learnt that use of huge quantities of chemical fertilizer and pesticides for company introduced seeds is nothing but a trap to take away our seeds and to make farmers permanent customers of the companies. Now we grow our local varieties of rice. In the coastal areas, we have many local varieties of rice suitable for cultivation in our conditions. These varieties are resistant to common pests. Organic manure, especially compost is very good for improvement of our soil. Many beneficial insects are killed by pesticide use. We are farmers we maintain our own seed in hand. This helps us to be self contained. Surya Begum, Tangail said, Aus and Amon paddy are suitable for low lands. The local rice varieties are suitable for our condition. Ramjan Ali, Chapainababganj said, there were many local varieties of rice in our locality. Most of those have eroded. There will be no scarcity of seed if every farmer maintains seed on farm. Local varieties of Aus rice - Shoni and Shonkopati are sown in Baishakh and harvested in Srabon. There is no need of using pesticides for these varieties. We do not use any chemical fertilizers because these cause soil imbalance.